Churchill's Confectionery based in Borehamwood (Hertfordshire) are a family-run business. Starting as a small, independent firm Churchill's has grown into an award winning global company. With more than 25 years' experience in the confectionery business they are an iconic British brand with their products being sold in the UK and many other countries worldwide. Churchill's Confectionery sell a delicious range of sweets, chocolates and biscuits. All their products are decoratively packaged in hand-crafted gift bags and novelty tins. It is this combination of mouth-watering confectionery with novelty packaging that makes them stand out from others. I was recently sent two new tins - Winter Morning and Winter Evening. Both the tins are 240 x 55mm x 160mm and are decorated with paintings by Monica Lambert. The Winter Morning tin contains delicious Chocolate Chunk Hazelnut biscuits while the Winter Evening tin contains Apple Crumble biscuits. Both the biscuits were delicious and of great quality. The tins (like all their other tins - Christmas Stockings, Dinosaur and Sealife tins etc.) are fabulous - beautifully designed and re-usable. Churchill's tins make for lovely presents. The recipients are sure to love them. If you would like to purchase Churchill's Confectionery's products, head to Amazon. And now on to the first giveaway of 2017! Churchill's are giving away two beautiful, new additions to their range - Olivia and Annabel - to one lucky reader of my blog. 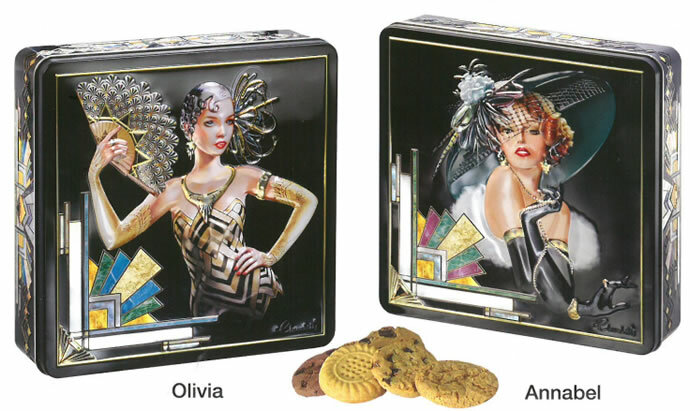 Both the tins are from the Art Deco range and feature lovely ladies on the lid. Packed with a yummy assortment of biscuits, these tins are sure to be well received. Entry to the giveaway is very simple. Just complete the mandatory entry option in the Gleam widget below. The more entries you complete, the more your chances of winning. All the best.